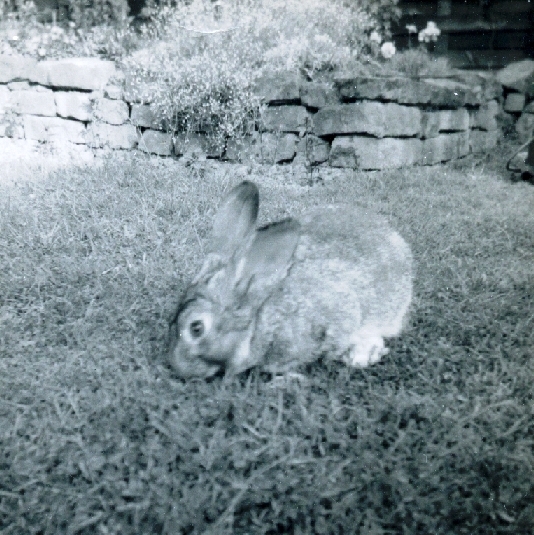 I have always loved animals and for my eighth birthday in 1960 my father bought me my first pet; the most beautiful, soft-grey young Chinchilla rabbit, which we chose from a stall on the old, open Nottingham Market on Huntingdon Street. The undercolour of a Chinchilla rabbit's fur is dark slate-blue at the base, light pearly-white at the centre, and the top is banded with black. Their tummies & under the tail are pearly-white. Hoppy was the rabbit that came up and nudged my hand as if to say ?Please choose me.? We took him home & put him in the hutch Mr Fenn, next door, had made for him. He was so small, he could sit in my hand. To house-train him we gave him the run of the kitchen, which had lino on the floor & he loved running round and round, flicking his legs in the air & once got stuck behind the cooker, which had to be moved so we could get him out. When Hoppy was a bit older, he had the run of the house & besides leaving the occasional rabbit droppings (which I called 'currants'), he never made any mess. His favourite hobby was jumping into the clothes' basket & dragging out anything that was in there: my Mum's bra, my pants, my Dad's socks, my sister's handkerchiefs. He also liked to climb up my Dad's trouser legs, while he was writing at the table & sit in the material under the knee. Shoelaces were something to be nibbled & the carpet was pretend grass to scrabble & dig in. We found rather bare patches all over the house. He specially loved treats of grapes, digestive biscuits & very occasionally chocolate!! To begin with my Mum made Hoppy a special harness from some kid leather gloves through which he put his front legs & it met & buckled on the top of his body. This harness was attached to a long lead to a stake on the back lawn, so he could roam, but not escape from the garden perimeter. He loved the raspberry leaves & we often had to untangle him, as he wrapped his lead round & round the raspberry canes to get the juiciest bits. As he outgrew his harness, he was allowed to have free run of the garden & loved eating pansies, rose petals & leaves & his beloved raspberry leaves. I was playing with him on my own on the back lawn one day & a huge Alsatian dog came bounding into the garden & went to attack Hoppy on the back of his neck. Hoppy just froze & kept absolutely motionless. I jumped up & shouted at the dog, grabbed Hoppy & ran indoors. He had had a lucky escape. 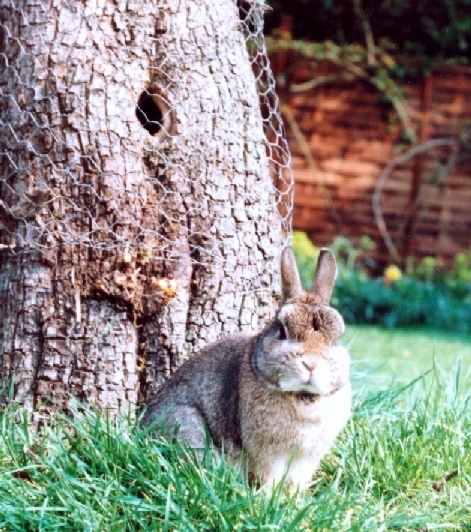 Once Hoppy escaped into a neighbour's onion patch & had a good meal, which didn't agree with him & upset his tummy. 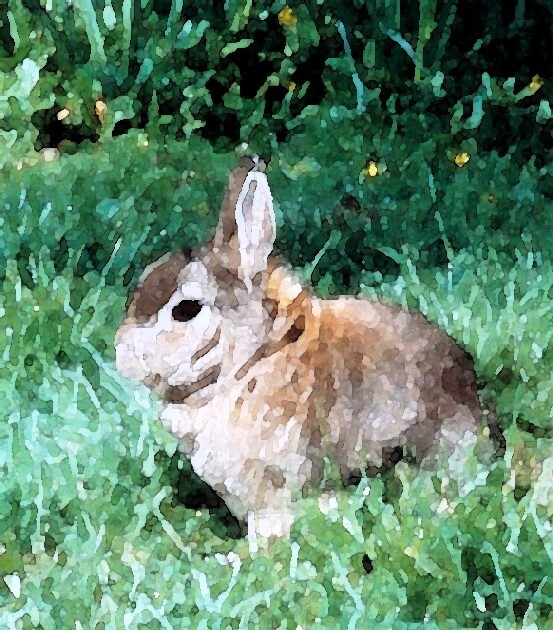 He was the most beautiful rabbit in his gentle, soft character & his looks. He died aged 8 from natural causes in 1968 when I was 16 years old & on holiday with my school in Switzerland. My Mum & Dad were in tears & buried him under a special rosebush in the back garden where he loved exploring, burrowing, sunbathing & eating his favourite leaves & plants. I've always loved rabbits since having such a beautiful first rabbit of my own. Sometimes he would set off on adventures and was once seen hot-pawing it up to Breckhill Fields, doing daring zig-zags and leaps to chase off the ensuing dog from down the road. We rescued him and he was none the worse for his 'dicing with death'. Now the area is quite built up. Gone is Breckhill Fields, which stretched out their greenness in a vastness known only when young. The gradual shift of the seasons softened or hardened the contours of this miniature landscape, my early experience of the countryside. It is now smothered with houses and called 'Long Acre'. In the early hours of a sultry June morning in 1979, I fell asleep with the radio softly playing. Miffy, my beautiful, black cat, just seven months old, was fast asleep, curled round my feet, as she did every night. Suddenly she was tapping my nose with her paw - her method of waking me up. She squeaked, jumped off the bed and padded quickly down the hall to sit, mewing plaintively, as she had when I first saw her. I sat up in bed, rigid, listening. Miffy had been given to me on December 27th 1978. I remember it as if it was last Christmas. The knock at the door had sent me clattering down the landing, stairs and lower hall. I opened the front door, then the porch. Lynsey stood there holding a small bundle in her arms. All the Christmas festivities were over, yet here was another present - a very special present. I had been talking to Lynn at the school I was teaching at, mentioning that I would really love a cat. I had been thinking about getting one for a long time. Lynsey had told me her friend's cat was having a very unseasonable litter of kittens soon and would I like one? And here was the one destined for me born on 19th November 1978. I took the woollen blanket from her arms, put it on the floor, unwrapped the squares of colour and there, on the green carpet, emerged a black, round shape of fluffy fur with a tiny, blue-eyed face and a tail smaller than my little finger. "Isn't she lovely!" I exclaimed to Lynn as she disappeared to her car. I had loved Miffy (as I'd named her) the minute I saw her. I was enthralled as the kitten began to walk on rather wobbly legs towards the rug near the hearth. Then she turned and frisked towards me. I knelt down and picked Miffy up. She was so small and fragile, so vulnerable. She fitted easily on my hand with room to spare. She was five and a half weeks old. Curled up against my shoulder, Miffy began to purr loudly. The turquoise litter tray was on the landing. Carefully I put the kitten down on the soft, white granules where she totally disappeared behind the sides. She began to scratch frantically, parting the litter this way and that, bits of white flying like snow onto the hall linoleum. She wriggled her bottom down, looked up at me with trusting eyes and a damp patch appeared behind her. The excited scratching was repeated, then she leapt over the side and scampered up the landing, then back down, skidding to a halt just before the banisters at the end. An exploration of each room commenced. I put her on the quilt on my bed and she turned a sideways somersault, skittered to the pillows, darted across to the bed's edge, falling off, careering into the living room again. That night she slept in the crook of my shoulder and neck, cuddling up for comfort and warmth. The next seven days found me bleary-eyed and tired. Miffy would wake me up with her paw tapping my nose in the middle of the night, wanting to play. When I went to the bathroom my feet became the object of surprise ambushes, my pyjama bottoms the rigging whereby she would climb up to her favourite place on my shoulder. Life was never boring and the depression over a recent illness miraculously lifted by this wonderful, innocent gift of life. As a kitten, Miffy had her own distinctive personality. She wanted to play, explore everything and eat whatever I was eating. She loved scrambled eggs, bacon, mince, sausages, brown rice, butter, cream, fish (especially sardines in tomato sauce). She crunched tiny cat biscuits with her needle-like teeth. I made toys for her; a piece of fluffy material on a length of string, a Ping-Pong ball to bat, a cotton reel, a toy mouse, a sheet of tissue paper, a plastic bangle. She would play intensely for a while, then fall asleep in her shoe box, waking up as lively as ever. As I walked round the flat and she wanted a lift, she would clamber up my legs (not too painful if wearing jeans) and perch on my shoulder like a diminutive parrot, watching intently what I was doing, or drape herself round my neck like a small, black panther collar. Typing was one of her favourite pastimes. She tried to catch the keys with her paws as I typed. Once when I had left the case off my old manual typewriter, I found the inky ribbon cascading down from the table. Painting afforded the luxury of paddling in different colours and nudging brushes just as I was about to make a master stroke. At Christmas I had been given a voucher for 'Habitat' and one Saturday, after battling with the January sales crowd, I arrived home with a rectangular wicker basket with a hinged lid and handle. Miffy was excited, as I lined the bottom with kitchen paper, then a folded blanket followed by an old, mohair jumper, which she loved to curl up on. 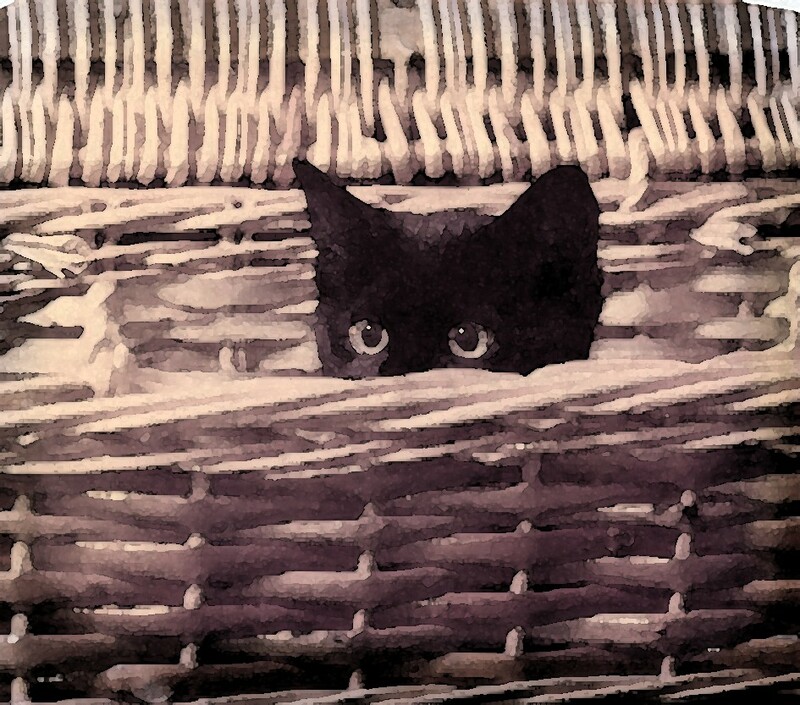 She had trouble entering the new basket, as the sides were high. The basket overwhelmed her and I couldn't believe it later when she actually filled the space comfortably. I bought her a jade green, velvet collar and a silver disc with her name, address and telephone number on it. It was a wrench returning to teaching after the Christmas holidays, for watching Miffy growing up with all her funny little ways patterned each day with her rich, velvety presence. She was the best Christmas present I have ever had and still is to this day. I sat up in bed, rigid, listening, straining to identify the sound. I heard a sharp, repetitive noise. Where was it coming from? I got up, switched the radio off and quietly switched the hall light on. The noise stopped. Miffy, now seven months old, was sitting, ears pricked attentively, outside the spare bedroom, where I kept my ironing board, easel, paints, frames and lots of cardboard boxes full of books to be unpacked. She looked up at the door. All the doors of my flat were rather old-fashioned, heavy, carved wood and locked from the outside with a big, iron key. I rarely locked this back room, but for some reason that night I had. I went to the bathroom, turned the hall light off, picked up Miffy and went back to bed. Immediately she gave a funny sort of squeak, then shot down the hall to sit outside the back bedroom again. The noise returned. I felt very cold and alone. I thought quickly. There was the noise again. It sounded like the Chemist shop below was being broken into. I wanted to go into the back room to have a look out of the window. Miffy danced and scampered up the hallway into the living room, where she mewed plaintively. I was just about to unlock the bedroom door, when Miffy mewed again, even louder, from the doorway of the living room and ran in again. Something was not right and I felt propelled into the living room, where I telephoned the police, hardly able to speak as fear constricted my throat. The Police, two Panda cars, two plain clothes detectives (six policeman altogether) arrived at my flat about five minutes later. The Chemist had not been broken into. My spare bedroom had. Two policemen with Alsation dogs searched the garden outside. "Lucky you locked that room. Could have been nasty," said one of the policemen, as they sifted through the back room. "You get that window fixed tomorrow and we'll send a Crime Prevention Officer round as soon as possible." I showed them out of the flat, cuddling Miffy, who had alerted me to the strange noises in the first place. I look back on those series of events as rather extraordinary. Miffy was a very loyal cat, who sadly died aged thirteen years and four months on March 14th 1992. I still miss her dreadfully. As every cat owner knows cats are telepathic. I only had to think "Where's Miffy?" A few minutes later she would materialise, winding herself in and out of my legs, purring ecstatically, as if to say, "Here I am!" Although I have another cat now called Misty, I am aware of Miffy's presence at times. She certainly knew something was wrong that night and made sure I knew too. I owed my safety to her and her special sixth sense. an aristocrat of the jungle. a queen of the dark. a sphinx of the silence. a witch of the senses. a watcher from the trees. a lover of the hearth. Barney was an adopted Netherland Dwarf rabbit. Some friends had a daughter, who couldn't look after him anymore, so Barney came to live with Ian, myself & Miffy in early January 1992. He came with his own lovely big hutch, a bag of sawdust & hay & his special rabbit food. I put his hutch in the garage for the winter. I worked out he had probably been born around 9th April 1986, as he was just under six years old when I adopted him. He was a very affectionate rabbit, but unfortunately only to me & bit everyone else!! I think he was a one-person rabbit & little did obviously not mean little in character. Netherland Dwarf rabbits are very small with big bold eyes, small ears, a lively personality & the most colour combinations of any rabbit. Barney looked like a wild rabbit in colour and had a beautiful cream underside. His favourite place was in the back garden under our 100 year old pear tree, where he would sit or flop legs out after chasing round the lawn & exploring the flower beds. Miffy didn't really take to him & just ignored him, following me everywhere like a black shadow, as she'd always done. I had noticed she was getting weaker & her back legs were giving way sometimes. Her appetite was receding, so I took her to the vets. Nothing really wrong was found & I tempted her with chicken & freshly cooked fish & she did seem to improve for a while. In March 1992, Miffy suddenly became very weak, her eyesight seemed to become poor & when she followed me round the house & garden, she wobbled on her legs. Using her litter tray was difficult too. She seemed to be fading before our eyes. I knew she was dying. She was 13 years & 4 months old. I rang the vet & made an appointment. I felt sick. Miffy was living in her furry igloo I'd bought for her & was too weak to really do anything. One thing I didn't want was for her to have an operation & die at the vets without me. She'd always been such a gentle & loving cat at home, but was really frightened of the vet's surgery. Ian came home & we both went into see the vet together with Miffy in her igloo. 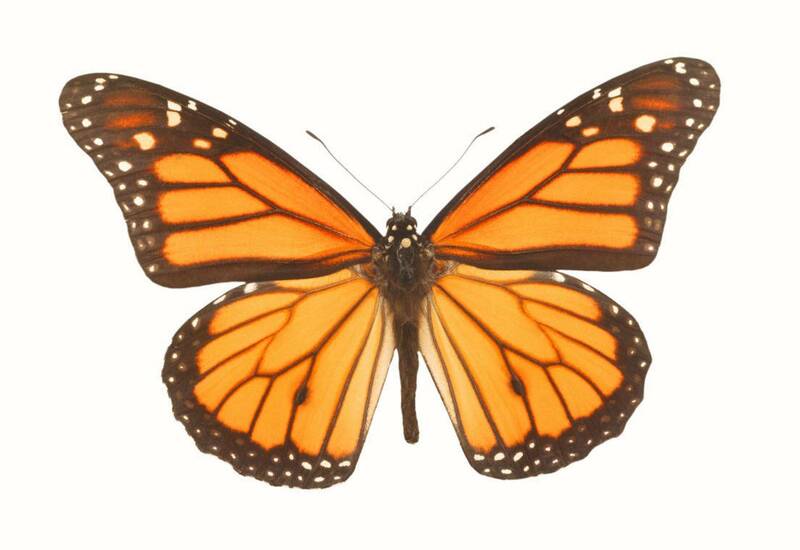 He examined her & said her abdomen was full of a mass & he could operate, but she was very weak. I was in shock. I made the decision there & then to have her put to sleep, though have often wished I'd had it done at home on my lap in her own surroundings. I told Miffy I loved her & held her while she was given the first injection, when she slipped into unconsciousness, then the second injection. Her beautiful green eyes were open, but glassy rather than bright with life, but she looked peaceful & I tucked her inside the igloo, tears falling down my face & I noticed Ian had tears in his eyes too. He went to pay & I went to the car & just sat with her on my knees, loving her in death as I'd always loved her in life. We buried her in the back right hand corner of the garden under the blossom & Laburnum tree with a special stone plaque & a black cat statue Mr Ball, my neighbour when I was a child living in Woodthorpe, gave me along with a pot frog from his garden. Later on I made a book of all her photos with her last collar & fur from her brush together with her toys, rug, brush & comb & put it in a special box. The inscription in the box was: "Always loved - always will be." Miffy was & is "as to a lamp shining in a dark place." Barney was a great source of comfort when Miffy died though as pet owners know, nothing can replace a lost pet. He was quite old though had a very happy last year and a half with me. But in April 1993 he developed an abscess in his jaw, which didn't respond to treatment at the vets & I was advised at one consultation on 5th May to have him put to sleep, because he would suffer & never get better. It was such a shock I burst into tears, as I thought his abscess was treatable. Again I wish I had thought about it & had him put to sleep at home, but I went home with a little lifeless furry curl on soft hay inside his basket. We buried him in the left hand corner of the back garden near his beloved pear tree & I bought a stone rabbit lying just as he used to & set it over his special place. The mewing outside the open bedroom windows increased in loudness and pitch. The night sky behind the curtain was indigo - stars slotted into spaces and the air was warm and still. I padded downstairs in my nightdress and opened the front door to the porch. 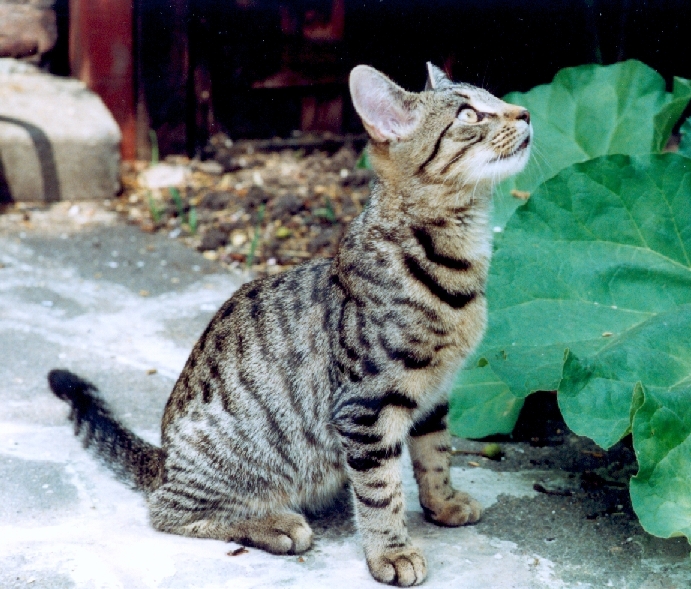 In the light cast onto the path, a small, long, slender spotted tabby cried to be let in. I opened the porch door. The tabby shot in, purring and wriggling round my legs. I picked him up, he licked my cheek, purred even louder and wriggled to get down. Immediately he walked with a positive determination to the kitchen. There was a full tray of cat litter and a food mat ready, as I was soon to be getting two kittens. I suspect this kitten whom I thought was five to six months old, thought it was specially for him. At the food mat he began to cry again, so I opened a tin of cat food and placed a saucer of milk on the mat. He attacked this with the ferocity of the hungry, jiggling the plates around noisily. We always knew when he was eating, because of this noise. Then he made a beeline for the cat tray and proceeded to use it with obvious relief. After frantic scratching and scrabbling, the kitten flew up the stairs bounding onto the bed, where my husband, Ian, was trying to sleep. The kitten wriggled onto his shoulder purring as loudly as an old petrol-driven lawnmower. When I clambered into my side, he jumped over to me frantic for affection and clung to my neck like a limpet, snuffling my hair and licking my cheek and ear. He was very wriggly and the name Wrigley stuck. The next day after breakfast and another visit to his litter tray, Wrigley bounded up the stairs and began to play with various toys I had found for him; a yellow, fluffy chick, a ribbon, a screwed up piece of tissue paper and corks, which were his favourites. He would retrieve them doggy-fashion for me to throw again. He would bat them under chairs and under the dining-room table and play at catching them from the other side. I proceeded to get ready for my friend's, Fay's, wedding with the help of a boisterous, exuberant Wrigley. I popped next door to ask my neighbours if they knew of anyone, who had lost a cat. 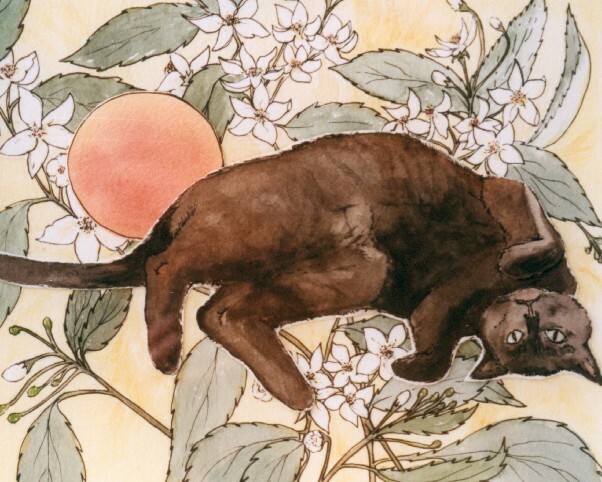 The kitten, tail straight and stiff as a mast, followed my feet, introducing himself, fluffing out his tail when the golden Labrador called Toby barked from their house. Following me like a private detective back to our house, I made sure Wrigley had water, food, a clean tray and plenty of shady spots in the house, as it was already hot at ten. He settled down in the igloo, which had belonged to my cat, Miffy. She had died in March at the age of thirteen and four months. I was heartbroken and we had just decided to have another cat (or two), when Wrigley appeared. We could not have wished for a more loving, enchanting cat. He seemed to weave a spell and his amber eyes knew many things. He loved us as much as we loved him, so we decided to keep him, as long as no one claimed him. We informed the local Cat Rescue and Welfare organisation, for we knew he had been well looked after, was extremely affectionate and loved human company. The two kittens destined to come to us went to other homes. Wrigley settled down from the moment he appeared, adopting us as much as we adopted him. He loved to play, be cuddled or lie sprawled out between Ian and I on the sofa. He adored the garden and the pear tree, which was a hundred years old and about twenty feet tall. He climbed up halfway at first, but the second time reached the top. The sumac tree was another favourite with thick, gently curving branches, ideal for resting on. Any near fall would be counteracted by both front paws grasping the branch, then swinging like a monkey, until his body scrabbled back to an upright position. The lawn was for chasing leaves, twigs, bees, flies and butterflies and his corks, which were caught with dramatic head-over-paws dexterity and other gymnastic displays. He would race into the lounge through the open patio doors, flying off chairs and anyone, who was sitting in them at the time, onto the front windowsill, sometimes bumping his nose on the glass in his joy and energy. As we got to know Wrigley, the more we loved him - his character was unique. A visit to the vets was arranged for a check-up and inoculations; also to arrange for neutering in the future. The vet seemed as enchanted as I was with Wrigley, who was interested in everything round him. He thought he was five to six months old and that he had a streak of an Oriental cat in him somewhere. On returning home, Wrigley marched straight to his food bowl, then proceeded to rush in and out of the garden into the lounge before settling down on the sofa between us. The telephone rang. "Hello, you don?t know me, but I know Diane Millward, who does a lot of work for the Cat Rescue and Welfare. She noted you had found a stray tabby. We lost one about three months old." I was stunned. "I've just taken the one we found to the vets. He thinks he's about six months old." I prayed he would not want to come and see Wrigley. "We weren't sure how old he was when we got him. He has a small, blunt face, large ears and a long body." I was silent. I knew Wrigley was their cat. I felt my stomach lurch. "We've put up posters, but no luck. Do you think we could come and look at the cat you've found - it's worth a try. Is it OK to come now?" "Yes, of course. Mind you, we'd be heartbroken if it was your cat. We adore him. We thought he'd just been dumped." "Think how we felt when we'd lost him." I knew it was their cat. I went into the lounge to watch Wrigley. Ian was asleep on the sofa. I woke him up and told him about the call. We sat watching Wrigley playing. Then he flopped down next to us on the sofa and wanted his tummy rubbed. The knock at the door sent that icy sensation through me again. Wrigley followed me to the porch. A youngish man with a turquoise T-shirt and small, bright blue eyes was standing there. "That's him!" he exclaimed, as soon as he saw Wrigley, who did something he never usually did: he disappeared. The young man showed me the poster with a photocopied picture of their cat they named Dylan. It was Wrigley. "Nikki will be so pleased," he said. "He's travelled quite a long way from Bakersfield. We offered a reward of £10 to anyone, who found him. Please take it for looking after him." "I can't,? I said, as he insisted again. "I love animals." Tears began to fill my eyes. I meant I loved Wrigley. I went to look for him in the front garden, but there was no sign of him. Ian came through the hall to the porch, cradling Wrigley. He handed him over. Wrigley scrabbled and wriggled to get free. I know he wanted to stay with us. He loved us; also the garden and the house were like paradise to him. He never wandered out of our sight. I stroked Wrigley's head and said goodbye. I watched as the young man held Wrigley and tried to open his car door. Then he reversed his red car down the road and was gone. I went into the conservatory and burst into tears. The days that followed were all dark. It was like another bereavement after losing Miffy, but I knew Wrigley was alive and we could not keep someone else's cat. It was the only time in my life I have wanted something that belonged to another person. I cried all night and the tears did not subside the next day. I dreamt of Wrigley, I kept going over how we could have kept him. I told myself he might come back as mysteriously as he had appeared. The book, 'The Incredible Journey' kept coming into my mind. One dream was of my art room, where Wrigley used to 'help' me, while I was writing, typing or painting. The room was now sparse and bare. There was a large, black hole to the right through which Wrigley had vanished. I felt it was my 'heart' room and Wrigley had, indeed, left a huge, black hole in my life and Ian's, which depression threatened to fill. As deep my sorrow is."